Most air conditioning systems use a series of ducts in order to move the cool air that they produce throughout your home. However, there are some systems that don’t use ducts and they are aptly named “ductless” air conditioning systems. While these types of systems do offer homeowners certain benefits, they can still experience issues just like any other piece of equipment. Here at Quality Air Heating and Air Conditioning, we’ve responded to countless calls for service and wanted to share some of the common problems that ductless mini split air conditioning systems can have. Not enough cooling – Probably one of the most common issues that we get called to fix for any type of air conditioning system is not enough cooling. If your ductless AC system isn’t producing enough cooling it could be caused by low refrigerant, a clogged air filter, a broken compressor or bad fan motor. New noises – If your ductless air conditioning system has started to produce any new noises make sure that you call for immediate repair. If your air conditioner is making a squealing noise, hissing or gurgling it likely will just get worse if you wait. Squealing is usually caused by a bad fan motor; hissing indicates that you may have a refrigerant leak; gurgling is a sign that you might have low refrigerant. System won’t turn on – Another common problem is when the system simply won’t turn on. This issue can sometimes be caused by a broken thermostat which controls when your air conditioning system. The motors in your air conditioning system have capacitors attached to them that provide them a boost of energy in order to turn on. Problems with the fan or compressor motors or capacitors can prevent your ductless system from turning on. 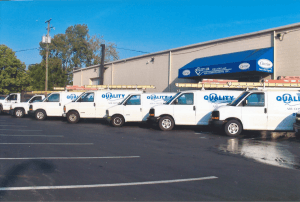 No matter what kind of AC system you have, call Quality Air Heating and Air Conditioning if you need air conditioning repair in Columbus.